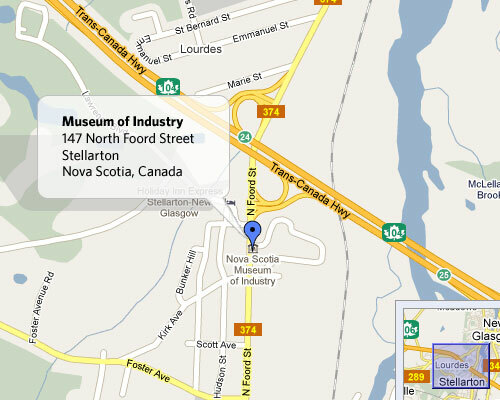 The Museum of Industry is located in the Town of Stellarton, Pictou County, in the heart of the Sunrise Trail. Visible from the Trans-Canada Highway #104, Exit 24, with on-site free parking, ample parking for RV, and fully accessible facilities, we are easy to locate and convenient to visit. By Air: The Museum is located 84 miles (99 km) northeast of Halifax’s Stanfield International Airport. Exit the Airport terminal to Highway #102 to Truro. Proceed past the town of Truro to exit 15A, on Highway #104. Travel 40 miles (64km) to Exit 24, which will take you to Foord Street, Stellarton. You will see the Museum to your left, and the entrance is only 500 feet from the highway. Pictou County is also home to a regional airport located in the town of Trenton, 15 minutes from the Museum. By Sea: Northumberland Ferries sail from Wood Islands, Prince Edward Island, and Caribou, Nova Scotia, up to 9 times daily during peak season, and operate from May to early December. The terminal in Caribou is only a 15-minute drive to the Museum, enroute to Cape Breton, Nova Scotia. A car ferry service departs from Bar Harbour, Maine to Yarmouth, Nova Scotia tri-weekly and departs daily from Portland, Maine to Yarmouth, Nova Scotia. By Land: Stellarton is centrally located in Nova Scotia. The Museum is located off Trans-Canada Highway #104, Exit 24, with the entrance only 500 ft. from the highway ramp. Travel time from Halifax or Moncton is 2 hrs and 3.5 hours from North Sydney.